Welcome to your ParentMail account, we hope you’re going to enjoy receiving your school communications online! First things first, you need to register your account – the good news is, this can be done in minutes! Your school will send you an email registration link if they have your email address in their ParentMail system. If you haven’t registered with ParentMail before, please follow the instructions below to register as a new user. If you haven’t received the email from your school, please note it may take a couple of minutes before the email arrives. However, if after a few minutes you still haven’t received the email, please check your spam/junk folders. If you find the email in your spam/junk folder, please change your account settings to mark ParentMail as a safe sender. Please also add info@parentmail.co.uk to your contact address book to avoid missing out on emails. Click ‘I don’t have a ParentMail PMX account’. The below window will appear. Check your details are correct. You can edit any incorrect details in the fields. Please also enter a password. Success! You have created your ParentMail account! You will now receive messages from your child’s school. If you have more than one child at the school, you will receive messages for both/all! Click ‘Let’s Go!’ to visit your ParentMail feed and to start managing your account. 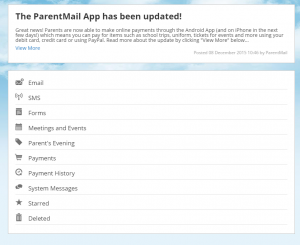 If you have an Android or Apple device, download the free ParentMail App to pick up messages on the go! If you can’t see any messages, your school haven’t sent any messages to you yet! When you do start to receive communications from your school, notification badges will appear next to the appropriate application. If you have previously registered with ParentMail, please follow the below instructions to connect as an existing user. Click ‘I already have a ParentMail PMX account’. The below window will appear. Enter your child’s date of birth by either typing in the field, or use the arrow on the far right to select from the calendar.